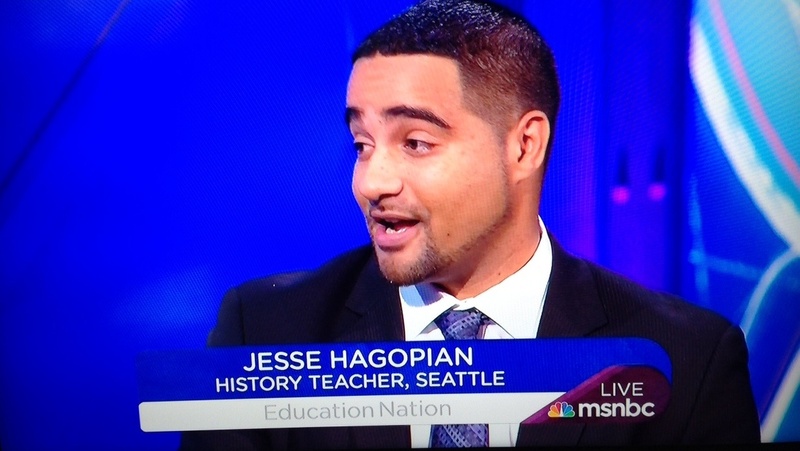 Teacher and activist Jesse Hagopian. Photo by Jose Trujillo. As the one-year anniversary of a Seattle police officer pepper spraying me on Martin Luther King, Jr. Day approaches, I sat down with the Seattle Weekly reporter, Casey Jaywork, to discuss ongoing struggles for social justice. Here are my reflections on police brutality, the intersection of race and class, and disrupting the school-to-prison-pipeline. A conversation with Jesse Hagopian. Last year, teacher and activist Jesse Hagopian broke the Internet—but not in a good way. On Martin Luther King Jr. Day, Hagopian was randomly pepper sprayed by a panicked cop. Video of the incident went viral, adding yet another chapter to the Seattle Police Department’s long history of excessive force. Hagopian is currently suing the city. But there’s more to this teacher than his receipt of SPD’s favored less-than-lethal weapon. With another MLK Day approaching, Seattle Weekly sat down with Hagopian to talk about race and justice in Seattle. SW: You’re a teacher and advocate, but you may be best known for getting pepper sprayed during last year’s MLK march. JH: It’s rough to be known for your worst day of your life. It’s hard that random people come up and say, ‘Oh, you were the guy who got pepper sprayed.’ To be known for such a low moment in my life can be difficult, but I think it’s also important that that moment serve as a lesson to our city: that nobody’s safe when we have unaccountable police. You still feel like that officer and SPD have not been held accountable. Absolutely…[Prior to getting pepper sprayed, I gave a speech about how] those who claim to honor [MLK] and degrade the Black Lives Matter movement are fraudulent. The words I spoke that day were about how King would be in the streets with the Black Lives Matter activists demanding justice. Many people today disparage Black Lives Matter activists–sometimes calling them thugs–but yet they like to give hollow remembrance to Martin Luther King. He’s kind of become a teddy bear. Right? Like a tame icon. And I wanted to call out that contradiction. I just think that it’s ironic that only a few minutes after I spoke those words, I was preparing to leave the demonstration to go to my son’s two year old birthday party, on the phone with my mother coordinating the ride, and an officer just–clearly without provocation, out of the blue–sprays me in the face and turns what was one of my most proud and joyous days into a deeply painful experience…The physical pain was one matter, but what was truly painful was trying to explain this to my kids at the birthday party. When a citizen has definitive evidence of police misconduct and wrongdoing, there has to be accountability for that officer. I had every possible advantage to be able to prove my case, advantages that most people will never have–when they take stands for justice, or when they just live their lives and encounter police. I had video documentation. I had many eyewitnesses. I have a lot of supporters in the community. And I had the [Office of Professional Accountability] rule in my favor. What more do I need to lay out a case that there’s a clear misconduct and wrongdoing? And yet the chief of police intervenes in my case and downgrades the discipline to the lowest possible form, overruling the [OPA]. I think that’s a real shame, and something that has to be corrected if there’s going to be justice. How have you seen the Black Lives Matter movement change over time? I think that we’ve seen an ebb and flow as different high profile cases go, but I would say that beyond the media representation of the movement, there’s been ongoing organizing of people committed to making black lives matter that might not be as visible but is definitely important organizing that’s deepening people’s understanding of the roots of institutional racism, and is also laying the basis for future, bigger collective struggle for police accountability, and also to broaden the Black Lives Matter movement beyond police accountability–to say that if we really want black lives to matter, then there has to be housing for African Americans. There has to be job programs, there has to be education that empowers our youth to solve real problems like racism in their community, and not just to score high on a test or be ready for a low-wage job in the economy. In terms of racial justice, what have been the most notable events in Seattle over the past year? Garfield began working with some different trainers on [restorative justice programs], and we’re now this year working on peace circles with the staff so they can really gain a strong understanding of the power of being able to solve problems collectively. It is my hope that we can roll out a full pilot of restorative justice in the coming years, and try to move away from zero tolerance. The important thing is that it actually gets support from the school district, and resources and financial backing, because to make restorative justice more than just a box to check…I think it has to actually have full-time coordinators who are trained in restorative practices. There has to be training for students and faculty around those kinds of practices, that can actually help students solve their problems. Rather than just punish them for transgressions, let’s actually empower them to solve the problem. What would that look like, compared to how things work now? Seattle public schools suspend African American students at four times the rate of white students for the very same infractions. So we know that there’s dramatically disproportionate discipline, and many schools have zero tolerance policies where you’re immediately suspended for different infractions. And oftentimes, it’s very discretionary for the administrations to perceive student behavior and make a judgement that they should be excluded from school for a period of time. And then the students miss school, they fall behind in their work, they become more bitter because the problem hasn’t been solved, and they often come back more likely to engage in the very same behavior and more likely not to pass their class or graduate. We know that that is part of the school-to-prison pipeline, where students who don’t graduate then turn to survival crimes, sometimes, because they aren’t the most desirable to be employed without a diploma. We want to sever the school-to-prison pipeline by putting restorative practices, which is bringing together the person that’s been injured and the person who’s been accused and actually make them do something much harder than stay home from school: make them face their problem with mentors and peers. Have them work through the issue, have them set goals, have them collectively figure out what a just resolution would be. That’s a much harder practice, but it demonstrates to our kids that our school actually cares about you. Not just when you’re scoring well on a test, not just when you’re doing well in school, but when you’ve made a mistake, when you’re down, when nobody else cares about you or people are angry at you–we care about you enough to help you solve this problem. That’s how we transform student lives and create better people through education. I’m excited to try to push for those kinds of practices. One of the triumphs of the strike this year was that the union pushed for race and equity teams and we won in the contract having thirty schools have race and equity teams. These teams can form with parents and students and teachers and community members to make recommendations about how to undo institutional racism at their school. Yeah. I would hope that those recommendations would be taken seriously by the school district and by the administration, and I would hope that many schools look at moving toward restorative practices if those race and equity teams find that their school is part of the disproportionate suspension rate. I think that one of the functions of that equity team could be to begin to organize restorative justice practices in the school. The strike and the fight for these race and equity teams should be seen through the lens of the Black Lives Matter movement. I think one of the high points of solidarity for the Black Lives Matter movement was a letter that many of the leading Seattle Black Lives Matter activists put out in solidarity with the strike, saying, ‘Your fight for public education is our fight, and your struggle for these race and equity teams are a prerequisite for having a culturally competent education.’ I was very proud of the Seattle movement when that letter was released. The restorative justice model sounds great, but it seems like political will and funding make it a longshot. Can this actually happen? The exciting thing is that it is being rolled out in innovative school districts around the country. Just a few weeks ago, I had an incredible opportunity to speak at a forum with Fania Davis, who’s Angela Davis’ sister, and the young people that she has been working with in the Oakland public school system. They have had incredible results with the restorative justice movement there–in terms of dramatically reducing suspension rates in the district overall, and at some schools completely eliminating suspensions altogether. One young man who spoke on the panel described how, in preschool, he had been suspended because he was having anxiety as a four year old when his mom would leave. And his mom left him with a bag of Skittles and said, ‘Every time you’re worried about where I am, pop one of these Skittles and then you’ll know that I’m thinking of you and I love you.’ The teacher caught him eating Skittles in class and confiscated them, and gave them to the principal who put them in [their] desk. He was crushed, but he had an idea: he saw the window open, so he crawled through the principal’s window and got his Skittles back. He wasn’t just suspended–he was suspended for theft. For taking back his Skittles. And he said from that day on, he didn’t trust school, and he didn’t trust those in authority. He was often suspended, and in and out of school. It wasn’t until he landed in one of the schools that Fania Davis was working at–that had a restorative practice, that welcomed him in from day one, with a circle to find out who he was and what mattered to him–that he realized that school could be a community that’s about supporting you, even if you’re African American, instead of punishing you. That’s what we have to move toward. It’s being done in communities around the country. The fact that we’re not doing it right now [in Seattle] is because there isn’t the will amongst those in power. You mean the superintendent and school board? The superintendent, for sure. I’m happy that we have a new school board. We just had an election, and I actually expect that the new school board will take unprecedented action and try to [pursue] a dangerous course that our past school board and officials weren’t brave enough to tackle. We can’t have any more incentive than we’ve had. It’s time. The students in the Black Student Unions around the city are ready for a move away from zero tolerance and have told many teachers across the city and other students that it’s time we move there. I think that they will definitely raise their voice on that issue and many others, to help the school board move as quickly as possible. When you say “maintaining institutional racism,” do you think legislators are consciously trying to do that? All the major, powerful institutions that run our society have replicated racism generation after generation. You can see that slavery was ended, but segregation continued. Not just in the Jim Crow south, but through the practice of redlining. Banks would exclude lending to African Americans outside of prescribed areas like the Central District. [Then] redlining ends, but you have mass incarceration…It doesn’t take Klan members to organize that type of racist practice. It just takes people continuing the status quo, putting the needs of communities of color last, not funding public programs…We have to have a conscious effort to undo institutional racism or it will be maintained. So if I’m a legislator, I can do racism by just being a cog in the machine without being a racist in a subjective, personal sense? Absolutely. It doesn’t take having overt racist ideas to continue to vote for a budget that primarily incarcerates African Americans and other people of color. We have to transform the institutions dramatically. That, to me, would look like fully-funding education, diverting the funds in King County toward housing programs and health care rather than toward mass incarceration. Can white students join Black Student Unions? Absolutely. And we usually have a mix of backgrounds that come to our weekly meetings. The [BSU] at Garfield has a mission of empowering black students and confronting racism. Anybody who’s interested in that mission is more than welcome to participate. We’ve seen some great collaboration between Muslim students and the Muslim Student Association and the BSU and students of all backgrounds supporting. Have you seen big changes in the thinking of white students who’ve become involved in a BSU? There was a really powerful moment when there was a non-indictment of [Officer] Darren Wilson [in 2014, for killing Michael Brown]. Over a thousand students walked out of Garfield, of all different backgrounds and races. And it wasn’t just Garfield that walked out: Roosevelt, which is overwhelmingly white, had a walkout, and several other schools around Seattle. It showed the potential for the Black Lives Matter movement and message to galvanize a wide spectrum of society and of young people. I think that that is a lesson that our movement should look at, and work on organizing all those people that knew that there had to be justice for Mike Brown. If I’m not a student, what’s a concrete way that I can help dismantle institutional racism? The campaign against the youth jail. We need our hundreds of millions of dollars set up for tutoring programs and job programs, not more incarceration. So joining with campaigns that are being waged around that would be really important. Participating in struggles around school funding and looking at restorative justice programs with the school district would be campaigns that I would highly recommend. I think the groups doing those campaigns are continuing to organize, and it’s my hope that those kinds of campaigns become bigger and more visible and begin more outreach to wider sections of Seattle. How can white people talk about racism? It sometimes seems–at least for me, as a white person–that I face a dilemma where if I say anything, then I’m worried that I’ll say the wrong thing, and if I say nothing then I’m complicit. Any advice? The key is the work. It’s not so much the exact way that you phrase your opposition or exactly what you say. To me, it’s: What actions are you taking to help us challenge institutions that continue to replicate racism year after year? As a white parent, can you go into the school and help work on forming a race and equity team at your kid’s school? You might not have the expertise, but you can work together with people who have more and help to implement something that could transform the lives of students of color in that school who are able to graduate instead of being pushed out [under] zero tolerance. You can join the campaign against the youth jail. You can do the work. As you do the work, you’ll learn more about theories and history that is important to help guide our struggles. [Don’t] let your uncomfortableness stop you from rolling up your sleeves and getting involved in the work. I’m inspired by many struggles in our nation’s history, when white people joined in the struggle for racial justice. We need to be reminded of that, and we need to continue to push white people to hold up the best of that legacy of the Freedom Rides, of multiracial dockworker strikes [that occurred] all up and down the West Coast in the Thirties. There’s many important examples of the abolitionist movement: William Lloyd Garrison, a white man starting an abolitionist newspaper and helping to train Frederick Douglass as a journalist, building a multiracial partnership that proved historically important when Abraham Lincoln was waffling on what the Civil War was going to be about. Was it going to just put the South down and reintegrate it into the United States but continue their practice of slavery, or was it going to abolish slavery altogether? I’m thankful that a mass coalition of multiracial people in this country was able to convince him that the war should be about ending slavery. And eventually he came to that position. I’ve just seen the importance of multiracial mass movements all throughout history. And I think that we’re desperate for another one today, when you look at Tamir Rice’s killer being let off, when you look at Sandra Bland–the officer who intimidated, and in my mind wrongfully arrested, Sandra Bland getting a slap on the wrist. Every day it seems there’s another example of gross injustice and deep racist practice of our country. We’re in desperate need of another mass uprising in this country that is about challenging the institutions of racism and redistributing power and wealth. What’s the relationship between class and race? They’re inextricably linked. Originally, the creation of racial categories was about maintaining the power of a wealthy, white elite. We’ve been studying this, actually, in school. Race was actually a modern invention that hasn’t existed very long. You can actually look at the first racial laws that were written, shortly after Bacon’s Rebellion in Virginia. That was multiracial mass uprising of white and black indentured servants and slaves that took over the Virginia colony for eight months. They burned the capital to the ground. And that mass multiracial power was terrifying to slaveowners and plantation owners, and they did what they had to do to maintain their power, which was what Frederick Douglass said: “They divided both to conquer each.” They wrote the first laws separating blacks and whites. They gave the vast majority of poor white people a little bit of wages, a little bit of benefits, so that they would separate themselves from African Americans and no longer work in solidarity. Which maintains the vast majority of both white and black people at the bottom, and a tiny white ruling minority at the top controlling all the wealth. All of that is rhetoric to deflect attention away from the fact that they have robbed us all, most blatantly when the banks sabotaged the global economy and then just pillaged taxpayer money to repay themselves. It’s an ongoing process that happens every day. They want us to fight amongst each other. They want us to blame immigrants or Muslims, rather than organizing a collective struggle to take back that wealth and to build a school system, a housing system, a healthcare system that meets the needs of all of us. I think that’s really the struggle that we have to engage in, and I think we’re at the very beginning of [it]. But I see great hope for the coming time as I see more and more young people getting active and raising their voice. Are we going to see you run for office anytime soon? [Laughs] No immediate plans on that. My work is so rewarding, to see young people getting active. And really, if there’s going to be a change in our society, it’s not going to be any shining knight coming in and fixing the problems. It’s not going to be any one politician. Are you thinking of someone specific when you say that? Not at all. I’m just saying that politicians aren’t going to be the source of fixing the problems in our society. I think what we’ve seen over and over again throughout US history is, when things get better for black people, when things get better for ordinary working people, it’s because they organize and make it happen. It’s because of the mass strikes in 1934 that won us social security and minimum wages and decent working conditions and the right to unionize. It’s because of the mass civil rights movement that brought down Jim Crow. A movement my dad was part of, the Black Student Union in his college, the University of Madison in Wisconsin, fighting for black studies so that we can learn about black history in colleges now. It’s always about organized, collective struggle. There are important instances when politicians can be part of helping encourage those struggles, but I’m always focused on: How are more people going to be part of organizing to put a better vision forward of what our city or what our society can be? What are you doing on MLK day? I’ll be back at the rally…I’m really proud to say that my [BSU] students are going to be emceeing the event. To me, that’s much more important than me speaking…It would be a [victory] for the forces of unaccountability and police brutality if I didn’t show up. So I’ll be there. This is a longer, but still edited, version of the interview which appeared in the January 13th, 2015 edition of Seattle Weekly.